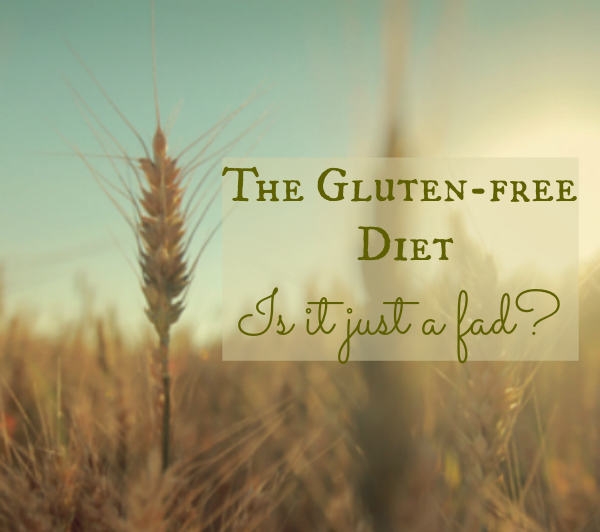 Home » The Gluten-free Diet – Is it just a Fad? What’s wrong with gluten? Is the gluten-free diet just a fad? Our type 1 diabetic son’s severe abdominal pain improved almost immediately. I later discovered he had high gliadin antibody levels which let me know what I already believed – his frequent trips to the emergency room were not due to stress as one specialist suggested. Many consider a gluten-free diet to be a fad. Others are open to trying gluten-free but not sure why it might help. I hope the following helps in your quest for answers. Gluten is a storage protein found in the mature seed of certain cereal grasses. Gluten is Latin for “glue” because gluten acts as an adhesive material. It’s what makes dough stretchy, rollable and twistable. This protein group is thought to trigger the most severe immune responses. Gliadins are alcohol soluble fragments and are broken down into three subtypes: alpha, omega, and gamma-gliadins. Most labs only measure for alpha gliadins which means that a celiac diagnosis can be missed for those who are sensitive to gamma or omega gliadins. This protein group is the sticky part and is responsible for the strength and elasticity of the dough. Glutenins are water soluble fragments. Some people have a severe reaction to glutenin but show a normal test result for gliadins. Some may do fine with barley or rye but not with wheat. Since wheat is the most commonly consumed form of gluten, it will be the focus of the remainder of this article. Why is wheat the villain? After all, mankind has thrived with wheat for centuries. This is the common mentality among those who consider a gluten-free diet nothing more than a fad. The truth is the wheat of today is a far cry from the wheat of yesterday. Our modern wheat will not survive in the wild as ancient forms did. Due to extensive cross-breeding and chemical interventions, we’re not eating the same plant our great grandmothers ate. This is why it’s critical to have a historical perspective when considering a wheat-free diet. What have we done to create our modern wheat? Einkorn wheat, the world’s oldest wheat, has the smallest chromosomal set with 14 chromosomes. Wheat can retain the sum of the genes of the “parents”, thus, when einkorn was mated with goatgrass, the more involved 28 chromosome emmer wheat was born. Einkorn and emmer remained popular for several thousand years until emmer mated naturally with tritium tauschii grass yielding 42 chromosome Triticum aestivum. Triticum aestivum was brought to America on the Mayflower and remained the dominant wheat until the middle of the 20th century when intensive hybridization led to our present day form of wheat. This wheat hybridization escalated in the 1940s and 50s thanks to the International Maize and Wheat Improvement Center located in Mexico City. 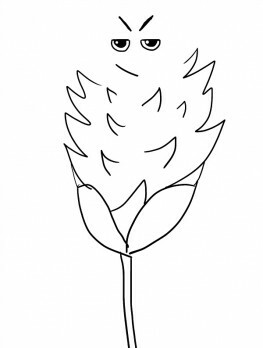 No attention was paid to the fact that while 95% of protein strains remain the same during hybridization, 5% are unique – not found in either parent plant. Modern wheat, despite all the genetic alterations to modify hundreds, if not thousands, of its genetically determined characteristics, made its way to the worldwide human food supply with nary a question surrounding its suitability for human consumption. It’s important to note that our modern form of wheat will not survive in the wild. It requires human intervention to accomplish the goal of increased yield, shorter growing season and easier harvest. Deamidation, used extensively in the food processing industry, uses acids or enzymes to make gluten water-soluble. (Recall that gliadins are alcohol-soluble.) 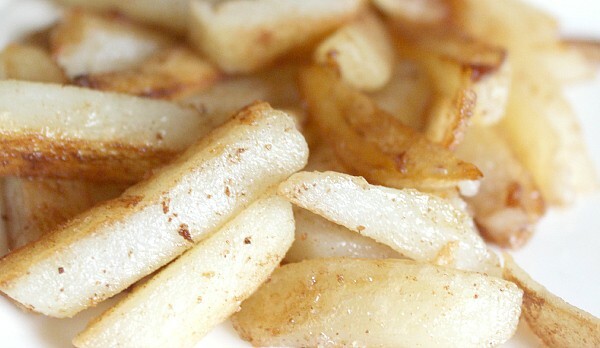 The gluten then mixes more readily with other foods. It stands to reason that deaminated gluten could explain food sensitivity for some who might do fine with other forms of wheat. See the study Allergy to Deamidated Gluten a Separate Phenotype to Wheat Allergy. 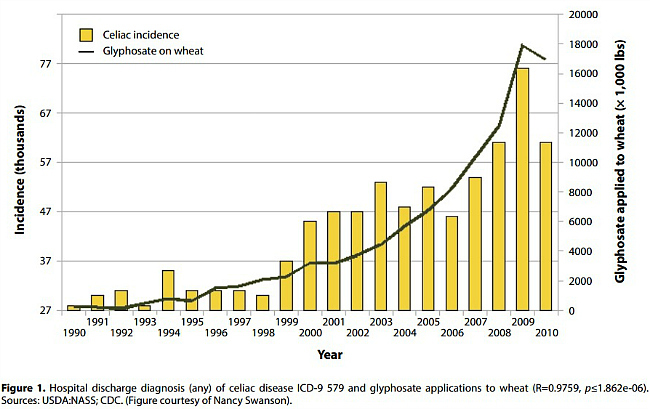 In their study titled Glyphosate, Pathways to Modern Diseases II: Celiac Sprue and Gluten Intolerance, Anthony Samsel and Stephanie Seneff reveal this chart showing a correlation between glyphosate wheat application and celiac disease. Given the hybridization, deamidation, and desiccation, is it any wonder that wheat has the potential to disrupt gut flora and create havoc with our immune systems? That gluten sensitivity is regarded as principally a disease of the small bowel is a historical misconception. Gluten sensitivity can be primarily and at times exclusively a neurological disease. The absence of an enteropathy should not preclude patients from treatment with a gluten-free diet. Early diagnosis and removal of the trigger factor by the introduction of gluten-free diet is a promising therapeutic intervention. Elevated cytokines are often seen in Alzheimer’s disease, Parkinson’s disease, multiple sclerosis, and even autism. Gluten sensitivity that does not show up in the intestines is sometimes referred to as the silent celiac disease. Extraintestinal manifestations include pain in the joints, disruptions in the skin, thyroid issues, as well as neurological problems. Current research suggests gluten sensitivity affects anywhere from 6% to 50% of the population. 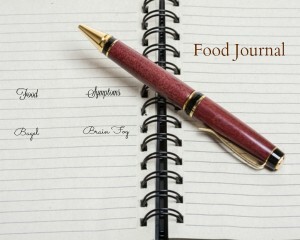 One way to determine if you’re sensitive to gluten or wheat is to keep a food journal. Pay particular attention to breaded items and record your mood and symptoms for a week. Remove all gluten for a period such as a month or six weeks. How do you feel? Do you notice any changes? Record these in your journal and watch for patterns. If there are no changes, consider taking out all grains for a period. After the gluten-free period add in food with barley or rye. Do you notice any recurring symptoms? If not, it’s possible you are sensitive to wheat only. It’s also possible you’re sensitive to modern wheat but not ancient wheat. We recently tried a homemade sourdough bread recipe using sprouted emmer wheat as well as quinoa flour, almond flour, and flax meal. The bread was delicious and those who tried it had no adverse reaction. Our family experiment backs up the study Effect of Tritium Turgidum subs. Turanicum Wheat on Irritable Bowel Syndrome: a Double-Blinded Randomized Dietary Intervention Trial, which found that those with IBS (Irritable Bowel Syndrome) showed far less inflammation after consuming ancient wheat. Our processed, genetically modified foods are presenting immune challenges as never before. A gluten-free, or wheat-free diet may be one of the best ways to experience improved health! « Haunted House? Could It Be Toxic Mold? This is a great post. I’m glad you laid it out like this for those that do think gluten free is a fad. It is truly sad the state of our digestion on a whole. Wow! Very comprehensive article! Thank you for the research and for laying it out so clearly. We have been gluten-free since 2009. I’ve had a lot of gluten questions lately – pinning this for reference! Thank you! This is a very good post Andrea. Very good information in proving that gluten-free diets are not just a fad. It’s so sad that people are more concerned with making more money than people’s health. I personally don’t think that gluten-free is always the answer (obviously for some people it is the only answer). People need to know that there is a middle ground for gluten sensitivities. For example, at our house all of our bread is sourdough and occasionally sprouted flour. All of our pasta is Einkorn pasta which as you pointed out doesn’t have all the issues that modern wheat presents. Yes, it’s very individual. I’m encouraged that we did so well with the sprouted emmer wheat. I’m glad you have found what works at your house! Great, comprehensive article! I’ve been gluten-free for four years and it’s really had a positive impact on my health. Thanks, Carol! It’s always nice to hear success stories. Andrea, I enjoyed listening to you host Midday Connections and now listen to Chris most days. 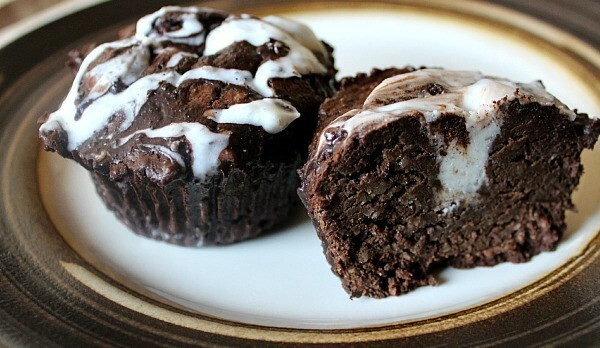 In the 70s when we were married, I began baking with whole wheat flour…no problem. 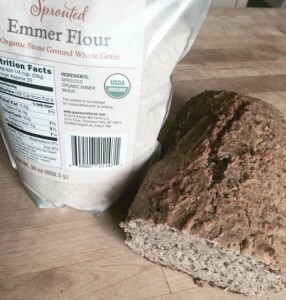 We get our wheat flour, PrIrie Gold, through a food coop, Something Better Natural Foods. We’ve also eaten wholesome food all these years. Only one of our children has health problems with allergies, frequent sinus problems, etc. ( and she lives in Tucson, and is pregnant again at age 40). One of her little ones has exema on her ankles. Any suggestions? She uses Bob’s Red Mill w.w. flour and buys organic food. With any kind of skin issue and allergies it’s always good to rule out any water damage in the environment because many of these issues can be fungal (sinus infections too.) As far as diet, sometimes a grain-free approach can help re-build the intestinal lining. I’m wondering if she was checked into the GAPS diet. Gut and Psychology Diet is for allergies and skin issues as well as other health issues for children. Tell her congratulations!